Got $25 for a dinner for four? First, you buy a book for $15 and then you pay $10 for the ingredients. No, I’m not making this up. It seems that when I was sleeping the Food Network anointed a new STAR. Her name is Melissa d”Arabian and she has a new book out called “Ten Dollar Dinners”. And get this, she means $10 for a family of four. Take that McDonald’s! The last time I went to McD’s, I spent $10 just on the two Happy Meals for my kids. Ouch. Other than being from outer space, she uses chicken, ground beef, grains, and lots of vegetables in inventive ways to make dinner both tasty and cheap. For example, she does a savory baked rice (9 cents per serving) that would be a healthy filler for when your bank account is running low. I got excited about the book's vegetables sections because I am always trying to convince people to eat more vegetables. If it is in your budget and the recipe looks easy, why not try it? All of the recipes in the book have a code next to them for how much they will cost you. You mix and match a main with a side to get to the $10. Melissa was kind enough to share her braised escarole recipe with me which is a side dish in the less expensive range of the vegetables. Escarole is a variety of endive whose leaves are broader, paler and less bitter than other members of the endive family. You can find it next to the lettuce. If you can’t find it, substitute raw kale or spinach for the escarole. I’m always trying to find ways to eat more greens and this one looks delicious. How do you stretch your dollar? Please share. 1. Place the olives on a cutting board, smash with the side of a knife, and then roughly chop. Set aside. Heat the olive oil in a large, deep skillet over medium heat. Add the garlic and red pepper flakes and cook, stirring often, until the garlic is fragrant, about 1 minute. Add the olives and escarole and cook, stirring often, until the escarole starts to wilt, 2 to 3 minutes. 2. Stir in the broth and lemon zest and juice, and cover. Reduce the heat to low and cook until the escarole is tender, about 10 minutes. 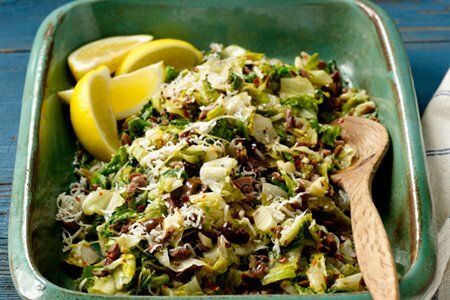 Remove the lid, raise the heat to high, and simmer the escarole until the liquid in the pan is reduced by one quarter, 1 to 2 minutes. Serve warm sprinkled with Parmesan and with a lemon wedge on the side. Is this a side dish? Or is this the main meal? If I put this on the table for my family for dinner, and offered nothing else, they would throw their forks at me. I think this would make a nice salad at lunch or a side dish with dinner! Nice recipe! I agree - was this listed as a "dinner" in her book? This is certainly not something that would be fulfilling as a main entree - possibly a side along with a main dish. My family would not be happy either if this was all I served! sounds good for a side, not enough protein for a main dish. My son and husband would not eat escarole no matter what I did to it. Kelly, the escarole and cheese provide enough protein. It's actually a healthy main dish, but most Americans who are non-vegetarians would not accept it as one. @Zennifer - Protein needs are generally based on each individuals body weight and needs. A body builder would require much more protein to efficiently fuel the body as opposed to a sedentary individual. With that being said, One serving of this dish equaling 3.8 grams of protein, I'm not too convinced that this would be considered a fair amount of protein for anyone. This is a side dish. I am going to change the above post to fix my mistake. Sorry, guys! Good idea but for a family of 5 here and 1 child is milk allergic this would not work. However for a side dish. I love Melissa d’Arabian. She uses real food and makes things seem so simple. I highly recommend her book and show. I love Melissa! I watch her show all the time and have made a lot of her dishes. Always so simple and budget-friendly! Actually you did call it a side dish in your intro to the recipe! Others didn't read it correctly! The Food Network website has a section on Melissa with many recipes. This was very good. I did add white beans to it and that made it very filling. I will next time try the splash of wine and maybe a smidge of pasta to make it a main dish when don't feel like cooking. Very simple to make. Of course, mine didn't look like the picture!! It clearly says in the article that this is a side dish not an entree. Is it suppose 2 b liquidly ?